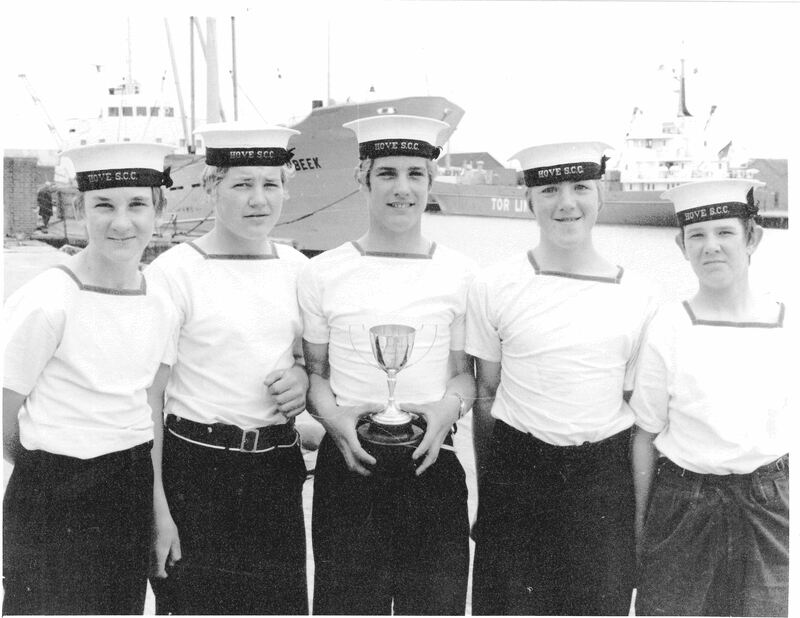 This photograph of a group of Hove Sea Cadets was taken sometime in the 1960/70s. I am sorry I cannot be more specific. It was taken on the jetty at the unit after we had won the cup shown here. I am second from the left in the photograph. Sadly I cannot remember the names of the others. Do you recognise yourself or anyone else. Do you remember this particular occasion? Or do you have any memories of the time you can share with us? I sent this photograph in. I believe I am second from the left. Pretty sure it was taken in 1971.The trophy was for whaler pulling race of some kind. I left in 1972 for Ganges, then Mercury, Gibraltar, Rhyl, Hermes, Blake. I left the RN in 1979 and joined the Canadian Navy. My family are still in Brighton and the surrounding area. First on the left is Barry Novis. Might be Sullivan 4th in. It would be around 1970 – 1971 at a guess as I was in the cadet band on cymbals. In mid-1971 while still in the SCC I passed an audition for the Band of H.M Royal Marines and joined on 18th January 1972. Nevil Witten was the unit PO at the time. Hi there, that wouldn’t be John William Patrick Sullivan by any chance, would it?